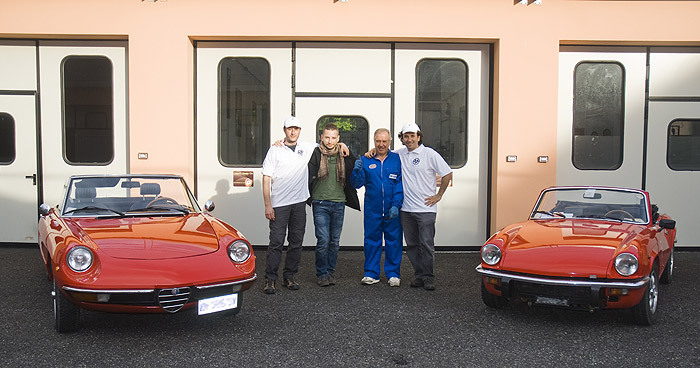 The origins of “Chianti Classic Car” can be found in Danilo Dini genuine passion for sports cars. Since the 60’s, Danilo has been a collector, restorer and driver of classic cars. Year after year, he started to fantasize about the possibility to share his passion, as well as the experience he was gaining, with others. What he had in mind was about the pleasure of driving a special car that has glamour and heritage, possibly on a road as charming as the car itself. A road winding trough the stunning beauty of the Chianti Hills or where an historic race took place and drivers such as Nuvolari and Fangio became legends. However there was still something missing to turn the dream into reality: a partner in crime! Danilo didn’t need too much an effort to convince his son Federico, who thanks to his father had grown up in a world made of pistons and valves, to join the project. The know-how of the father and the energy of the son: together they have more than 55 years of experience in this business. Federico joins the project well aware that he will contribute to the success of the company bringing his international experience in tourism, culture, art and communication. The Chianti Classic Car project had officially come to life with the goal to start a classic car hire company aimed to provide its services both to tourists and companies. In the vision of the founders, however, “Chianti Classic Car” had to be much more than just renting: in fact classic cars are regarded as the core of a much broader experience that includes discovering destinations famous all over the world for the beauty of the landscapes as well as for their artistic, historic, cultural and gastronomic heritage. Chianti Classic Car is now a young and fast growing company providing services to an international client base of tourists and companies, looking for a high standard of services and competitive prices.